Delegate Taylor attended South University's 2014 graduation ceremonies, delivering the commencement address. The theme of the speech reflected South University's marketing slogan, "Take your biggest step yet." Click on the video below to watch the entire speech. The Assembly passed a budget putting a condition on Medicaid spending: "no general or non-general funds shall be appropriated or expended" to expand Medicaid under Obamacare until a vote by the General Assembly. This condition, among other things, is what Governor McAuliffe is attempting to line-item veto. However, The Supreme Court of Virginia Case Brault v Holleman makes clear that, if a budget includes a spending item that comes with a condition, the condition cannot be separately vetoed. To exercise his line-item veto for these conditional budget items, a governor must veto both the condition and the spending. The governor's veto would be ruled unconstitutional. As you may know, Senate Republicans took back control of the Senate Chamber last week. Within days, we called the General Assembly back to Richmond, passed a clean budget that did not include Medicaid Expansion, and brought an end to the Democrats threats to shutdown Virginia's government. From the beginning, I strongly pushed to decouple Medicaid expansion from the budget. When the first Senate session began with Republicans back in control, we were able to pass a budget in less than six hours – something that Senate Democrats had been unwilling to do when they were in control. 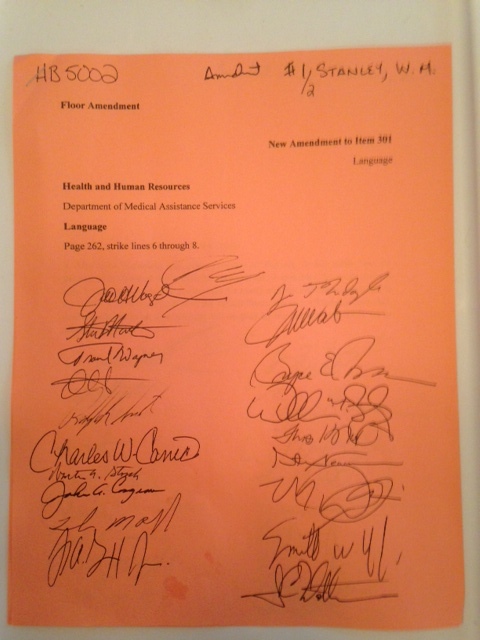 To ensure Medicaid expansion cannot be implemented unless the General Assembly specifically authorizes it, I sponsored an amendment (which the media has been calling "The Stanley Amendment") that was co-patroned by all 20 Senate Republicans. 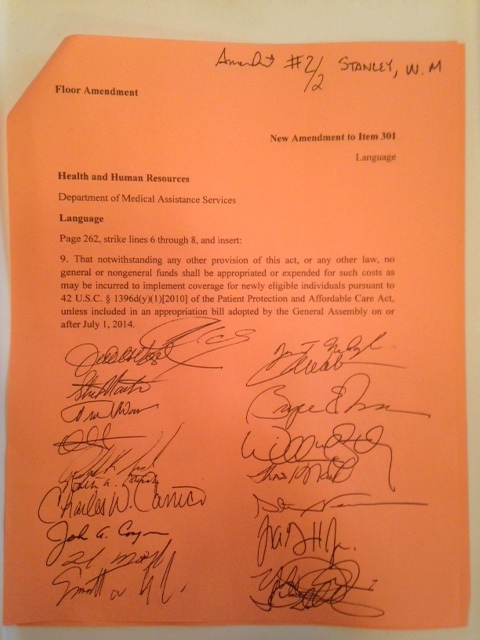 The Senate approved my amendment 20 to 19, and the House concurred 69 to 31. The amendment keeps McAuliffe from legally expanding Obamacare in Virginia on his own. Even though the bill is on the Governor's desk, the fight is far from over. On Friday, Governor McAuliffe stated that he would veto the Stanley Amendment and try to expand Obamacare in Virginia without legislative approval. 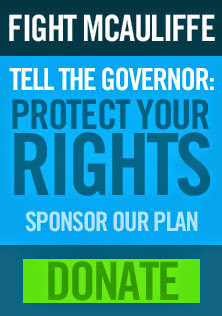 Governor McAuliffe does not have the authority to unilaterally expand Medicaid. If he ignores the Constitution by continuing on a course to do so, I am confident that he will be given a refresher course on the limits of his powers from both the legislative and judicial branches of Virginia government. Because of my leadership on this issue, and my commitment to conservative principles and traditional values, Governor McAuliffe and the Democrats have already recruited a candidate to run against me. They are determined to return the Senate to Democrat control by trying to defeat me in 2015. I need your help to fight back. Would you please contribute $20 for the 20th District so I can continue to stand up to the Democrats and their Washington-style tactics? 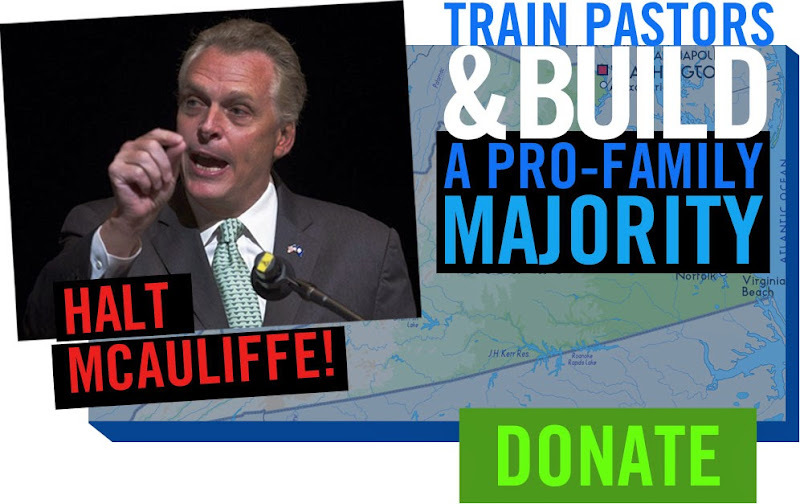 Terry McAuliffe will try to regain control of the Virginia Senate in 2015 and your contribution today will send a message to him – and his liberal Washington friends – that we need Virginia solutions, not Washington's problems. Your help today will make a big difference as I fight to ensure the Senate of Virginia retains a conservative Republican majority for the duration of Terry McAuliffe's term and Barack Obama's. If we all know what to do, then why don't we do it? Why is it that our knowledge does not align with our actions? Could it be that our knowledge is far superior to our capacity to act on it? Is our failure to act purely a flaw in human design or could it be that this seemingly lazy behavior is learned or even rewarded? Students learn that they need only to deliver an intelligent insight -- or an intelligent critique of someone else's insight -- to impress their professors. They don't have to actually implement the recommendations or act on the insights that emerge in the conversation. "But this is that which will indeed dignify and exalt knowledge, if contemplation and action may be more nearly and straightly conjoined and united together than they have been..."
Most of us can draw on immediate experience to recall examples of smart-talk and the knowing-doing gap. In my studies, I recall "class participation" was, indeed, a significant portion of the final grade. What about in the business world? How many mission statements are actually carried out? How many ideas hatched in committee meetings actually make it past the meeting minutes? What about the CEOs and managers? They may "dress for success" and appear knowledgeable, but do they even know what their smart talk means? Does this remind you of anyone? Have you ever worked for a CEO or manager that actually turned their smart-talk into action? How many of them do you feel were smarter than you? Did they obtain the leadership positions because of real action or was it a resume full of positions and certificates achieved via the path of smart talk? I can certainly appreciate the value of a visionary leader who is a gifted smart-talker but only when they effectively put their words into action or if the leader is at least wise enough to delegate the doing to their managers and employees. I have seen evidence, both anecdotal and scientific, that corporations can only go so far on the "fake it 'til you make it" premise. Making matters worse, most organizations and their leaders are not even aware of their knowing-doing gap. "Between the conception / And the creation / Between the emotion / And the response / Falls the Shadow." As you may have already guessed, my direction here is that the knowing-doing gap can only be closed by some form of awareness. This applies, of course, not only to organizations but to individuals as well. Knowledge is power but it certainly is not wisdom. The smart-talkers seeking short-term rewards will frame questions by asking "why" while corporate leaders and individuals seeking long-term goals and lasting success will frame questions by asking "how." The path to self-awareness, furthermore, will have us ask the more difficult questions, such as "Who am I?" and "Where am I going?" While our world certainly rewards smart-talkers, and I will not say that smart talk is purely negative, but my objective here is to help others awaken to their own path -- the path that ideally originates from the inner world. This awakening, if you will, almost certainly requires the shattering of conventional wisdom and the undoing of what we have been taught -- that our knowing does not need to align with our doing and, more importantly, our being -- that we are somehow smaller than our dreams. By now you've read the headlines: House and Senate Republicans united to pass a budget that addresses Virginia's $1.5 billion revenue shortfall and does not include Obamacare's Medicaid expansion. As I mentioned in my previous email, the shortfall was filled partially by accessing the Commonwealth's rainy day fund. The balance was filled by cutting spending. Despite these cuts, we were able to protect funding for K-12 education, mental health reforms, and investments in the Virginia Retirement System. For detailed information about the budget, please click HERE. At no point did the budget include language that would have allowed the Governor to expand Medicaid without the approval of the Medicaid Innovation and Reform Commission. However, because reports suggested that Governor McAuliffe may act on his own to expand Medicaid, the General Assembly added a clarifying section that unequivocally prohibits the expansion of Medicaid without the approval of the legislature. Now that the budget has passed, I am encouraging Governor McAuliffe to sign it without any substantial amendments and without inserting Medicaid expansion. We cannot afford further delays. Thank you to all who took the time to contact me, call the Governor's office, and sign the petition urging the Governor to pass a budget. Although I expect the Governor and the Democrats will offer a proposal to expand Medicaid, I am pleased that we passed a clean budget that includes no provision for expansion. Once the budget is signed, we can return to Richmond to debate Obamacare's Medicaid expansion and its impact on the Commonwealth. Virginia State Police Association, Inc.